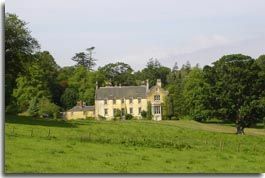 Bargany House, 19 miles southeast of Ayr on the banks of the River Girvan, is a late 17th Century unfortified mansion. Work on the surrounding park began 1826, and the walled garden early 1900s. The house was probably built for the Dalrymple - Hamilton's, in this estate known through history as being the land of the Bargany Kennedy's. The estate has three castle ruins from the times of the Kennedy's, although nothing much remains of them. The Dalrymple - Hamilton's are believed to be descendants of the Kennedy's. The mansion house was extended in about 1840, and a new three story wing added to the north of the 17th century mansion between 1862 and 1876. Much of the original plasterwork, believed to be by Adams or Gibbons, remains. Bargany house has had a few owners over the years, including the author Axel Aylwen. The Dalrymple - Hamilton's, returned to Bargany a few years back, undertaking a major restoration of the old building. Bargany Gardens, with scenic walks and pond, are open to the public for a few weeks each year, normally in May. The area around the house is private.